It has been a long time since I want to build a proper controller for GP Bikes. I create this thread to share with you what has been done and the next steps of development. The controller I want to build should allow riders to control more realistically the different bikes by using Steering Torque as an input and Bike Angle as an output. I will update this post regularly. Please keep in mind that the controller is only a prototype for the moment. The parts and design are subject to change. The servomotor is obviously undersized. Quick video showing the Rolling Angle used as an input for the the servo motor. On the video the bike is controlled via a Bluetooth keyboard as the main purpose is to show the servomotor driven by the bike angle. The data is received via UDP and sent via Wi-Fi to the microcontroller. An Ethernet connection will be probably used in the future. The servo control program code is still "under construction" for obvious safety reasons. As soon as the handlebar will be mounted on the structure, I will post a video showing how the Direct Steering Torque works. For the moment, calibration is needed. 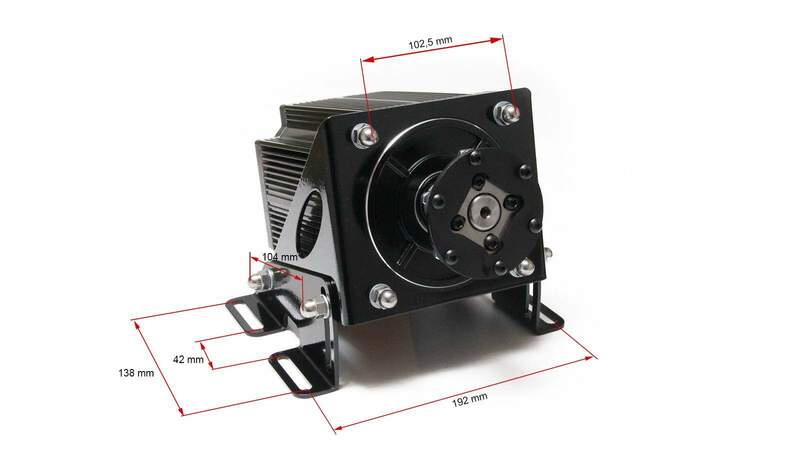 The next big task is the sizing and selection of the the servomotor. First version of the rig made of aluminium profiles. The rig will probably be redesigned in the future. For now, I need something convenient I can easily modify. Stability plates will be added. For the moment the handlebar is fixed on the rig and has no DOF. A first "rough" calibration has been made to set the basis. It is a good starting point to evaluate the needed input. Quick video showing Direct Steering Torque with fixed handlebar. I put two LEDs to give a basic preview of how the torque is applied. Those LEDs turn on when torque is applied; the brightness is also relative to the torque. It's not really representative but I hope it makes it easier to visualize. At low speed the bike is out of control. I need to understand how to handle it as it seems that I will need to modify my software for this specific condition. Direct Steer Torque mode works fine until the bike reach a "high" lean angle. As soon as you release the amount of torque on the handlebar, the virtual rider stops to lean left/right and it leads to a crash. Surprisingly, using the "normal" steering mode is really intuitive using torque input. I'm looking forward to try it with the servomotor installed. mounting the servo on the rig. Will come back to look at evolution. Good work there ! In my own project, i'll be using that motor - you can have it in 20 N.m or 30 N.m. Indeed, car sim servomotors will be powerful enough for this application but I'm affraid it could be oversized. As the rolling angle is not really a "Force Feedback", I believe the needed Torque should be less important (also less pricey). What kind of software are you using? What do you think is the problem with low speed steering? I'm planning on building a similar controller using an Arduino, but haven't gotten that far yet. I'm using Arduino software and C#. I am not sure about low speed yet but I'm investigating. In my project, the rig is not moving. Only the handlebar. It may seem ''funnier'' to have a moving rig but from a physical point of view I realized it is not the best solution. The data is transfered via UDP and processed to the servo.